CLEVELAND, Ohio -- Browns punter Reggie Hodges was right. 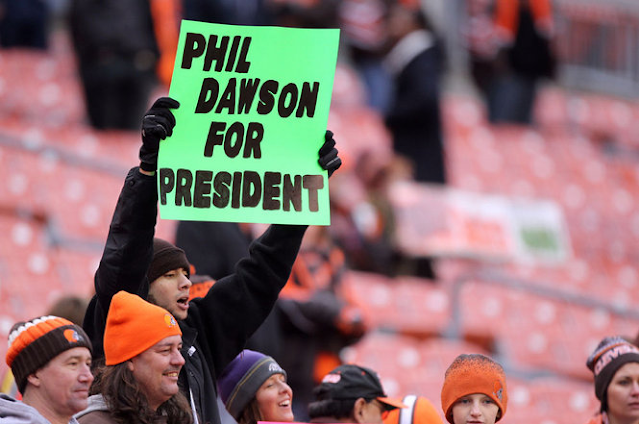 Browns fans should rise up and help catapult kicker Phil Dawson into his first career Pro Bowl. Currently, Dawson isn't even among the top five vote-getters in fan balloting on NFL.com, which closes Dec 17. Granted, the fan vote accounts for only one-third of the total, but it would certainly go a long way. Players and coaches, who make up the other two-thirds, vote later this month. But no kicker in the NFL has fared better this season, especially considering the adverse conditions Dawson's had to kick in. He's made all 21 field goals, including a stunning five of 50 yards or more, to lead all NFL kickers in field-goal percentage. An NFL-record three of those 50-plus-yarders came in one game against the Ravens. He's also been perfect on his 20 extra-point attempts. Dating back to last season, Dawson's made 27 straight field goals, which is a league-high and matches his career best. Also stretching back to last season, he's made 12 kicks of 50 yards or more -- tops in the NFL. He's equally as proud of his 19 touchbacks and the fact that the Browns are second in the NFL in holding teams to a 20.2-yard kickoff-return average. And at 37, he keeps getting better with age. "I've worked extremely hard," he said. "The experiences pay off. I've had great teammates around me that have given me opportunities. Alex Smith, for example, is our wing on field-goal protection, and we put him on our best rush corner each and every week and he takes care of that for me. I'm not the fastest guy to get the kicks off. If you don't have excellent protection, you've got to hurry up the process, and sometimes when you do, you're not as accurate. I can't overstate what a big role he has provided for me being able to be back there, be comfortable, take my time, and the accuracy follows. So it's certainly a team effort, and I'll just continue to work hard and see how good I can get." Can he get much better than this? Time for a luau.